How to correctly adjust the lifting chains on a Simpro MegaDumper bin lifter. MegaDumper bin-tipping machines generally have two lift rams – one attached to the back of each mast. The rams extend downwards, and each ram has two ‘ram rollers’ running on a cross-bar on the end of the spear. Two lengths of ½” transmission chain are attached to brackets by each ram head, with adjusting bolts. These chains run around the ‘ram-end rollers’, then up to the top of the machine, and around rollers at the top. One chain from each ram then goes down inside the ‘near’ mast (to which the ram is mounted), and one goes across through the top frame and down inside the ‘far’ mast. Therefore there are two chains inside each mast – one from each ram. 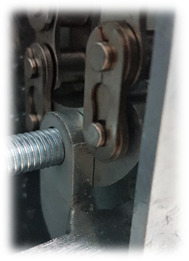 The chains connect to ‘equaliser bars’ which pivot off the top of the ‘mast slider plates’ which support the cradle axles. This system ensures that the weight of the bin and cradle is always evenly distributed across all four chains and both lift rams. However, initial setting up and adjustment of the chains is quite complex and must be done strictly according to the procedure outlined below. Levelling of the equaliser bars. 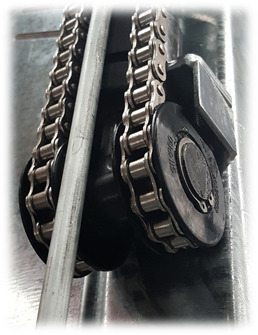 The lift rams are not mechanically or hydraulically synchronised, and are sometimes slightly ‘out of sync’ before the chains are adjusted correctly. 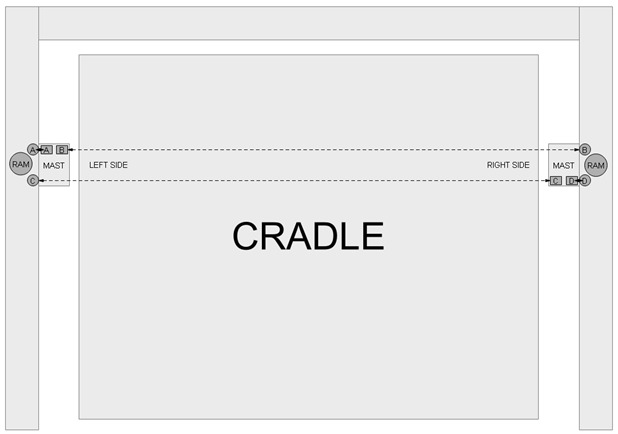 The cradle should sit level, when sighted or measured off the floor or the main frame. Ideally, the equaliser bars should be level; however, it is acceptable for them to be slightly out of level if (for example) one of the adjusting bolts does not have sufficient length. The front of this equaliser bar is ~6mm lower than the back; the pins are ½” (12.7mm) apart. This back of this equaliser bar is ~3mm lower than the front, but is acceptable. If you are ‘starting from scratch’ (i.e. 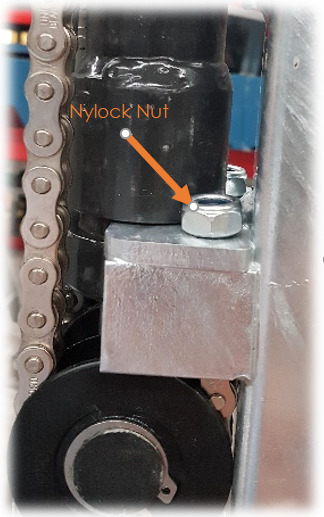 not just doing a minor adjustment to a machine that has been already set up correctly), wind the Nyloc adjustment nuts on, so the slack in each chain is taken out. Raise the cradle so it is approximately level with the main frame cross-member. Measure the distance from the underside of the cross-bar on the bottom of the ram (i.e. between the ram rollers) to the ram stop on one side, and cut 2 pieces of 50 x 25 timber or steel RHS to this length. Note the actual length is not important, but both pieces must be the same length. Look at the equaliser bars to identify whether they are sitting level. If not, note the approximate discrepancy on the Excel chart of the lowest end of both equaliser bars. Note that the pins are approx. 13mm apart. Based on the figures entered, the Excel chart will automatically calculate how many turns to wind down the Nyloc nuts on each adjusting bolt. Refer to the diagram below to make sure you adjust the correct bolts. 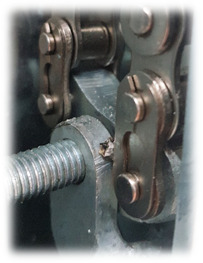 Note that bolt B is on the right-hand side of the machine, but alters the left side of the cradle. Similarly, bolt C is on the left but alters the right side of the cradle. After making the adjustments suggested by the Excel chart, measure the cradle again, and check how level the equaliser bars look. If not correct, enter the new figures into the chart and repeat the process.